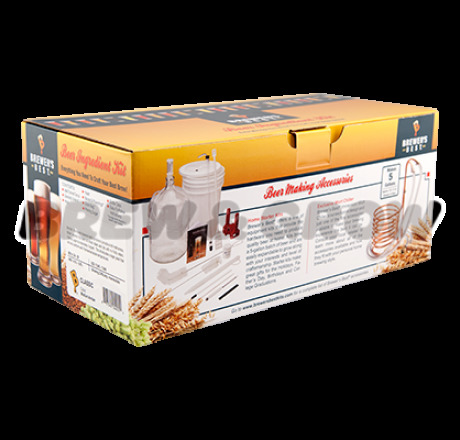 Beer & Wine Craft stocks one of widest selection of Brewer's Best beer kits you'll find in the Atlanta area. Each kit makes 5 gallons of beer (approximately 53 12-oz glasses). All kits include all the ingredients with proven recipes to produce prize-winning brews. 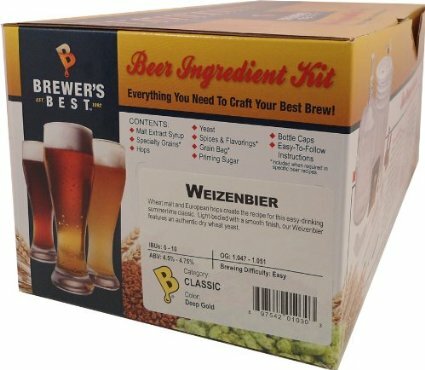 We stock one of the widest selections of Brewer's Best beer kits you'll find in the Atlanta area. Kits available in-store only. Cannot be purchased online. While supplies last, our mid-summer beer kit sale is a great way to stack up on summer suds. Buy one beer kit and get 15% off on the purchase of the 2nd kit. Want to try brewing one gallon of beer before jumping into 5-gallon batches? It's fun, it's easy, and you can make great beer. All the equipment, ingredients, and directions are included to make you a successful brewer. Small batches are a great way to get started or to brew serveral styles to have on hand without overloading your stock. Save on the Beer & Equipment Package for only $75. All classic recipe kits conform to the BJCP Style Guidelines. Classic recipes are generally in stock and available in the store. They are not available through online ordering. This recipe uses the traditional combination of pilsner malt, rice and corn adjuncts. It is light-bodied, refreshing and thirst quenching. A very easy recipe to brew and an excellent entry to craft brewing. One of the world’s classic beer styles, this recipe is best enjoyed when lagered. Pilsner malt extract produces a straw color. A dry beer that finishes with ample hop bitterness. This kit includes a lager yeast that will also perform well if fermented at ale temperatures. This medium-bodied brew has a malty character surrounded by a nutty aroma. Crystal malts with a touch of chocolate malt create the brown color balanced by a subdued hop flavor. A classic English style that yields medium-high bitterness above a foundation of caramel maltiness. Hop character is derived from a heavy bittering addition. This is a well-balanced, drinkable Special Bitter. A classic German style, this Altbier is amber colored with a nice malty character. It is moderately hopped maintaining the true style of this Amber hybrid. A great beer to ferment cool and cold condition. A crisp, clean, easy-drinking ale. It has a straw-yellow hue similar to a pilsner, but is less hoppy, a bit sweeter and uses pale malts and a small amount of wheat. In order to achieve the lager-like characteristics this ale is famous for, we recommend using a liquid Kölsch yeast. Bold and black, yet sweet and subtle. This recipe offers all of the chocolate and roasted notes that you would expect from a stout. Addition of Lactose produces a full body, thick, creamy head, and sweet finish. A medium-light bodied ale with a deep red hue. Our Red Ale is smooth and easy drinking. Nice balance of caramel malts and specialty grains. Low hop bitterness. A pale ale that uses just the right amount of Munich and Honey specialty malts in conjunction with Rye liquid malt extract to create a unique spiciness. Then we use a blend of different hop varieties to perfectly balance the beer - and it’s dry-hopped! Wheat malt and European hops create the recipe for this easy-drinking summertime classic. Light-bodied with a smooth finish, our Weizenbier features an authentic dry wheat yeast. A light-colored German lager with a malty profile. Slightly sweet with just enough hops to balance the malt. This kit includes a lager yeast that will also perform well if fermented at ale temperatures. At last, a Gluten free ingredient kit that can be enjoyed by all! The wort is crafted from White Sorghum and Belgian Style syrup, complemented with orange and lemon peel additions. Lightly bitter with undertones of floral and citrus from the hops, this ale is smooth and refreshing. Premium Recipe all-malt ingredient higher-alcohol kits are big in taste and bold in flavor – not for the weak of heart! Premium recipes are generally in-stock and available in the store. They are not available through online ordering. This Tripel contains one pound of light Belgian candi sugar to create a high gravity beer that is golden in color with a creamy, white head. This kit has plenty of dried malt extract and specialty grains to accent its complexity. The hops create a mild, spicy character. This recipe produces a malty, high-gravity, full-bodied version of this easy drinking, well-rounded beer style. Golden in color, Imperial Blonde Ale uses the lightest malt extract available and a unique balance of domestic and imported hops. A great recipe if you like big blondes! A rich, complex high-gravity specialty ale. It’s a fullbodied brew with plenty of hop character to balance this Imperial-style Brown Ale. The slight caramel and chocolate flavors are followed by a nutty aftertaste. Includes premium Safale S-04 yeast. Perfected on the West Coast and we are proud to create an extract version of this beer style for the homebrewer. This beer is very big, very hoppy and somewhat arrogant. Use your homebrewing skills to make the most of this recipe! A medium-full bodied ale, rich and toasty in flavor. Victory® malt combines with the flaked brewers oatmeal to offer a nutty yet silky character. Dark chocolate barley adds an impression of roasted coffee. 2-row malt is included to aid in converting the oats’ starches into fermentable sugars. The selected yeast will yield a fermentation that leaves a slightly sweet character. Dark brown in color, this rich, full-bodied ale is smooth with chocolate and coffee-like overtones. Smoked malt imparts a complex, pleasant aroma and flavor with a balanced and subtle hop finish. Specially selected dark malt extracts and specialty grains combine to release a delightful bouquet of chocolate and roast. We have included a package of genuine whisky barrel oak chips to impart flavors of oak and whiskey. A classic white ale brewed with wheat, barley, orange peel and coriander. It is lightly hopped and fermented with Safbrew WB-06 resulting in a fruity, spicy, refreshing beer with a dry finish.